Is that lust or lush? A post card in honor of Dr. Ed. 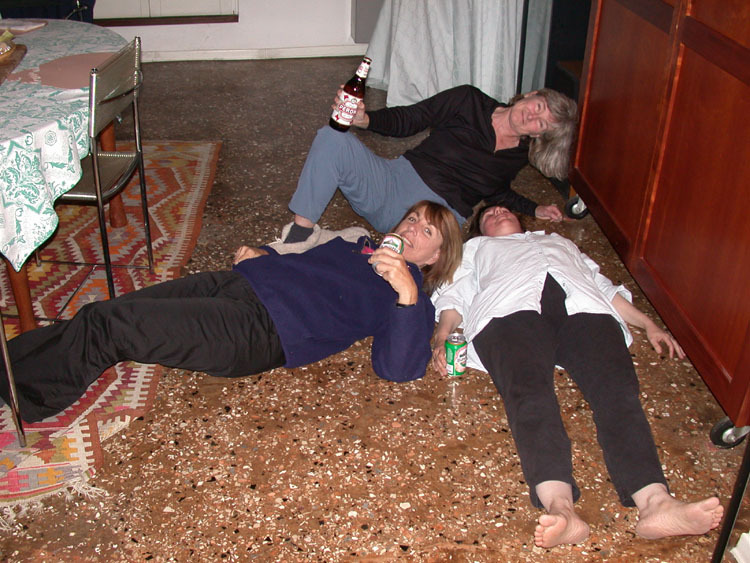 Here is Maryann on the left, Marian on the floor - er, the right - and Julie appearing more conscious behind them. Dear Edward, We missed you last night. Dinner was not the same without your company. Venice is not the same without you! JB and I are leaving Venice on the 26th hoping to get out into the country side for a change in scenery. Yesterday was hot and sunny , today it looks cooler and cloudier. Dear M & JB (wherever you are) It has been very beautiful in the burbs for the past 3 days. Kinda cool cause we had snow the night before last which lasted on the lawn making going out to get the paper in bare feet a quick journey. Yesterday was very windy--this Morning (Sat) is clear and I have to continue to clean the pool. News update: Thor Heyerdahl of KonTiki fame is dead. I loved the picture of you fallen women. And of course I was stunned by the news that Julie had been married 3 timed. But I suspected it all along. Dear JB and Marian, Who is Harry? I feel really dumb, but can't remember a Harry. You obviously know him.